See what our loyal clients have to say about us. I’d like to thank you for being so helpful and proactive with this and developing an app which I think is amazing. AppTheBusiness have done a superb job of my App, the design, content and feel of the product is first class and I am very excited at how this portrays my business for the future. Thank you so much Jen for all your help in producing a fantastic logo for my company. When we began this process I really had no idea of what I wanted but thankfully AppTheBusiness were able to guide me to my choice, by finding out all about my company and me, and then designing lots of different options for me to choose from. Even better, I was able to shortlist and take bits from one design to put with another, until I had what is now my logo. I couldn’t be happier with the service and logo I have received – thank you! Once again thank you for the work you have done, we are really pleased with the new logo and stationery. Thank you for your brilliant work, both the app and website are excellent. We cannot have been the easiest clients but Jen, our on-boarding adviser, patiently advised and guided us through the process of setting up our new Web-site and Accountant’s App. We are very happy with the result and clients old and new have given incredibly positive reactions. New clients in particular just see us, straight away, as modern, digitally savvy accountants, all thanks to the team at AppTheBusiness. There is no point in wishing we had created an app sooner (but I do!). Senior Director, SRPduBarry Chartered Accountants. The service we received from AppTheBusiness has been exceptional. They have been professional and responsive throughout the process and delivered an incredible product that we are more than pleased with. Huge thank you to all those involved with bringing our company into the 21st Century. Thank you to the team at AppTheBusiness for their great work on designing the JCWallace mobile app, we are delighted with the final product and the feedback from our clients has been really positive. 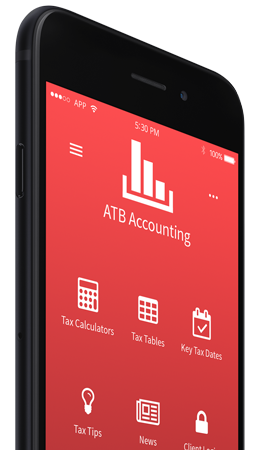 We launched the app alongside our Making Tax Digital (MTD) campaign and hope that the combination of our mobile app with cloud accounting software such as QuickBooks will provide a great solution for our clients. The app was great value for money and we look forward to working with AppTheBusiness using the push notification and other features. Thank you! Client Manager, JCWallace & Co.
For the last ten years, we have been using an outdated website which doesn’t represent our firm very well. So we spoke with AppTheBusiness, they created an amazing website within a quick turnaround period. We are now proud and extremely happy with our new website. Jen is amazing, always helpful and quick to respond to our queries. We would not hesitate to recommend them. AppTheBusiness built our website and mobile app approximately a year ago and have maintained them for us since then. We have found them responsive and approachable and would be happy to recommend them to any accounting firm requiring support for its web presence. When we set out our plans to deliver a highly personalised & digital driven Accounting practice we turned to AppTheBusiness for help. From designing the website, the app and helping with the content, we have been delighted with each step of the journey. The end result for our business is a fully digital forward thinking website, delivering a clear and concise message. Whether you are looking to re-launch an existing business or you are starting for the 1st time, the whole AppTheBusiness team grasp the requirements and get the job done in a timely fashion with excellent end results. We couldn’t recommend them highly enough.